RCM coin? Any guidance would be appreciated. You got one of these in your change?! Nice find. I saw this coin sell quite recently for $32.65. Click here. I know nothing else about it, other than the colour registration is horrendous, and in the printing industry we would consider this totally unacceptable — in other words, a misprinted reject. The registration of your loonie looks a little better but the red is still out by a mile. IMHO, I can't imagine that the RCM intentionally released these. odd coin and the price was right, zero. J am going to contact the seller on Ebay and see if he knows anything. Glad to be of help. Let us know what you can find out. methinks the loonatics have taken over the asylum. Also contacted RCM, waited 30 minutes to talk to a person and then got transferred and waited some more. RCM people were nice, but no help. They suggested contacting more than one coin dealer. They could not go back to 2002 records. Long story short, no further ahead. hello new to this community but i was looking up this loonie that was given to me by my late uncle as a gift. cannot seem to find any info on this. Happy to see that it is rare thought. 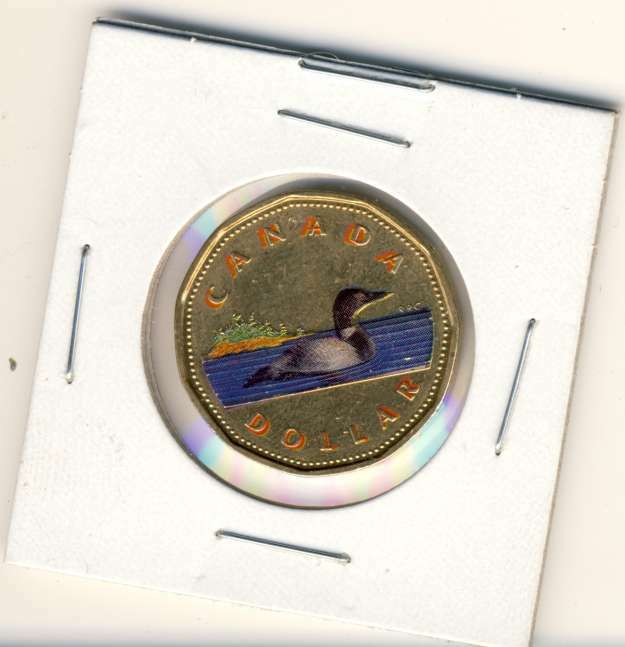 Sxa189 wrote: hello new to this community but i was looking up this loonie that was given to me by my late uncle as a gift. apparently another coin collector told me that it was made from First commemorative MINT. That would make sense because a lot of coin collection that he gave me came from that MINT.